10-12-2004 11:45 am Director-General of UNESCO Koïchiro Matsuura has named Professor Vitit Muntarbhorn of Thailand the winner of the 2004 UNESCO Prize for Human Rights Education. 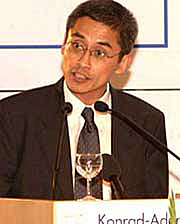 Vitit Muntarbhorn, born in 1952, Professor of Law at Chulalongkorn University, Bangkok, has devoted his life to human rights education activities, notably through his teaching and his participation in training sessions, seminars and conferences. An expert and consultant for several United Nations organizations, he is also the author of numerous publications and learning tools (including board games with a human rights theme). Since July 2004, as Special Rapporteur on the Situation of Human Rights in the Democratic People´s Republic of Korea, he has been mandated by the United Nations Commission on Human Rights and the United Nations General Assembly to examine the state of human rights in that country. Mr Muntarbhorn was recommended for the Prize by an international jury which met in Paris last October 16 and 17. Four Honourable Mentions were also awarded. One has been given to Professor David Jan McQuoid-Mason (South Africa) for his work in human rights education, particularly with schoolchildren (Street Law workshops), students, prison staff and police officers. Another Honourable Mention recognizes legal expert Anatoly Azarov (Russian Federation), founder and director of the Moscow School of Human Rights (MSHR). A non-governmental organization, MSHR conducts human rights education projects and produces Russian translations and adaptations of handbooks and videos on human rights, disseminated in schools and also in prisons. The Oslo Coalition on Freedom of Religion or Belief (Norway) is an international network of representatives of faith communities, NGOs, international organizations and the scientific community that promotes freedom of religion or belief. It will also receive an Honourable Mention for its project “Teaching for Tolerance and Freedom of Religion or Belief”. The Instituto Peruano de Educación en Derechos Humanos y la Paz (IPEDHP, Peru) is the fourth recipient of an Honourable Mention for its work on behalf of human rights. A non-profit educational association, it is developing notably the project “Frontera Selva” that aims to disseminate knowledge among indigenous people about human rights, democracy and participation in civic life. The UNESCO Prize for Human Rights Education, awarded every two years, was established in 1978 to mark the 30th anniversary of the Universal Declaration of Human Rights and to honour efforts of institutions, organizations or individuals that have made a particularly significant contribution to human rights education and the promotion of human rights. The laureate is named on December 10, Human Rights Day. This year the UN High Commissioner for Human Rights and UNESCO have dedicated the day to human rights education. Former prizewinners include Václav Havel (Czech Republic) in 1990; the Arab Institute of Human Rights (Tunisia) in 1992; Justice Michael Kirby of the High Court of Australia in 1998; the city of Nuremberg (Germany) in 2000; and the Academia Mexicana de Derechos Humanos (Mexico) in 2002. The Jury considered 55 candidates. It was composed of Abdelfattah Amor (Tunisia), Chairperson of the United Nations Human Rights Committee; Kinhide Mushakoji (Japan), President of the Asia-Pacific Human Rights Information Centre (Hu-Rights Osaka); Nasila S. Rembe (South Africa), holder of the UNESCO Oliver Tambo Human Rights Chair at Fort Hare University (Alice); Dina Rodriguez Montero (Peru), Director of the Gender and Peace Studies Department at the United Nations University for Peace (Costa Rica); Rumen Valchev (Bulgaria), holder of the UNESCO Chair for Human Rights and the Culture of Peace at Bourgas Free University, in Sofia; and Antoine Valéry (France), President of the Committee on Human Rights and Ethical Issues of the French National Commission for UNESCO. Mr. Matsuura will present the prize to Vitit Muntarbhorn in Bangkok at the end of March 2005.